This module is part of Tuleap Entreprise. It might not be available on your installation of Tuleap. The Test Management plugin of Tuleap aims at providing a simple and easy way to deal with test campaigns. Test Campaign: a collection of Test Case to run. Test Case, Test Campaign and Test Execution are 3 different trackers. Environment is a property of “Test execution”. Test Management is stable and used since 1.5 year at Enalean for all Tuleap releases without any issues. The welcome screen of Test Management lists all active Test Campaigns with a quick overview of the overall progress and the ability to access the test list. By hitting “Test list” you will see the list of tests proposed in the given campaign. In the following figure, the user selected a test that “Passed”. One can switch from one state to another (a test can be “Not run” then “Passed”, re-switched to “Not run” because tester didn’t get what was described to finish by “Faild”). It starts as soon as you load the test definition. It ends when you hit one of the action buttons. Time is not yet used in the interface, it’s only recorded for a future usage. You can see the value and make your own computation from the “Test Execution” tracker. You can also directly create tests in campaigns, this is convenient if you don’t already have a base of tests or if you want to create test. You can also edit the test directly from the interface. 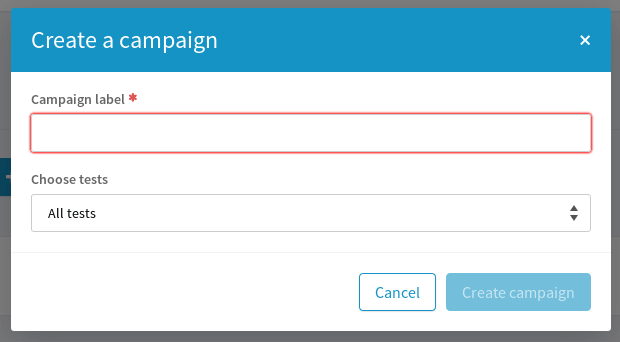 The test you create or you edit are automatically updated in the test campaign and will be re-usable in a following campaign. Starting Tuleap 10.3, a test case can be divided into steps. Each step have to be run in the campaign. Field step execution into Test execution tracker. If one of this field is missing, steps cannot be run. 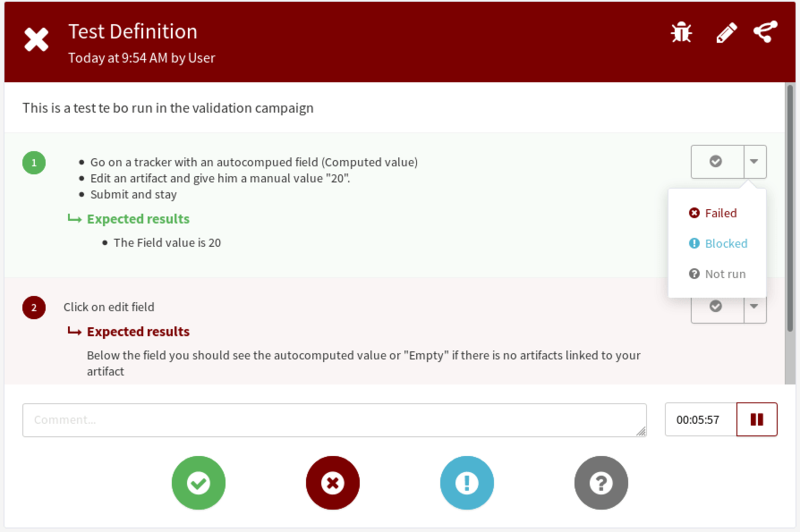 In addition, these fields can only be added in the Test definition tracker and Test exec tracker defined in your testmanagement configuration. From the home page of the service, there is “New campaign” button that will open the Campaign creation screen. You need to give a name to your campaign and select which tests you want to execute during your validation campaign. Once the validation has started you might want add some new tests to your campaign. Open your campaign by clicking on “Details button”. Then click on the “Edit” button. A new modal will enable you to look for existing artifacts or to create directly a new one. If your project also uses the Agile Dashboard service, a “Test campaigns” tab will be added to milestones. After clicking on this tab, you will be able to create a new test campaign from Test definitions linked to the Milestone’s items. For example, you have a user story in a Release “Version 1.0”. You can link a Test definition to this user story. Navigate to the “Version 1.0 milestone, click on the “Test campaigns” tab and then create a new campaign. In the modal, you can choose “Milestone tests” which will select all the test definitions linked to “Version 1.0” milestone’s user stories. This section is experimental and you will need to have access to ttm CLI tool to make it works. Ask your Enalean representative if you want to go further. 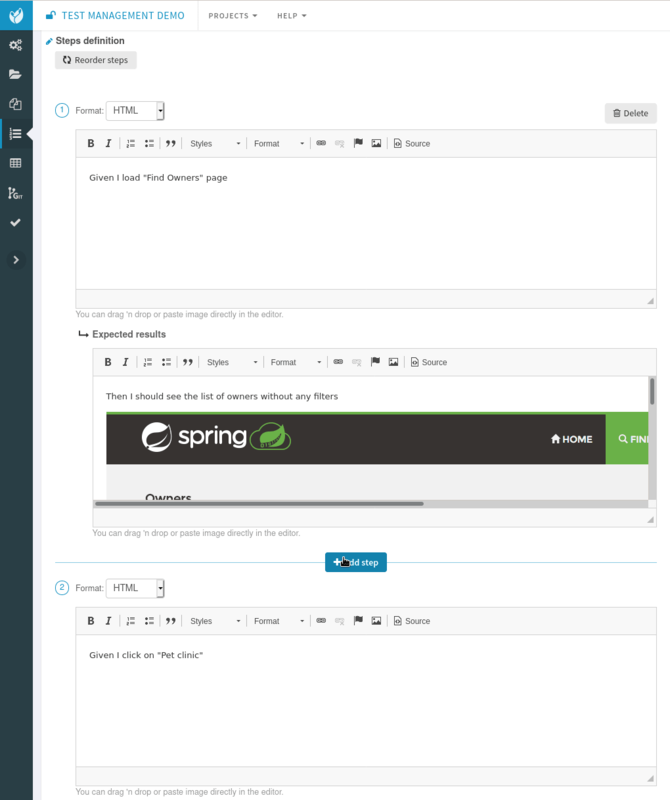 TTM relies on an external tool like Jenkins to execute tests. Any CI tool can be used. Test automation itself is not TTM business, you can use whatever tool you want (robot framework, cypress, selenium, etc) as long as it produces a junit XML output with results. In the next sections we will describe how to setup TTM with Jenkins. First you need to create a new Tuleap user that will be used by Jenkins to report test results. This user must be configured Tuleap side with the appropriate permissions to update “Test Executions” and read “Test Definitions”. We recommend using a dedicated user with limited permissions to reduce risks of credentials leaking. At Jenkins side, you need to register this Tuleap user in the “Credentials” section. Create a new entry for “username and password” and give it a descriptive id like jenkins-tuleap-bot. You also need to upload the ttm binary on Jenkins server. The “Test Definitions” tracker must have one string or text field with name automated_tests. We recommend to add it close to “Description”. You can set whatever label you want, only the name is meaningful. 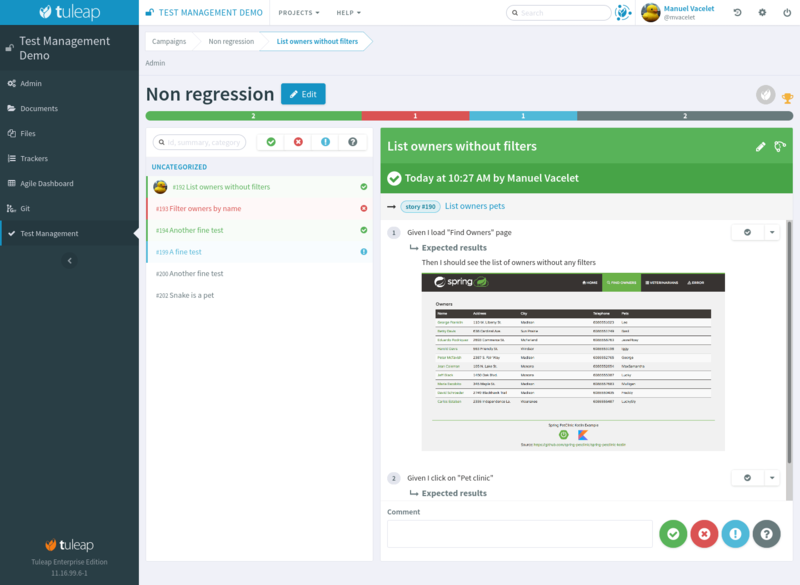 Starting from Tuleap 9.19 the automated_tests field is part of the default Test Management tracker templates. Then you should edit the generated Jenkinsfile to adjust Build and Test phases to your process. You can create as many steps and stages as needed, the only constraint is to keep the def ttm_credentials and the stage('Reporting'). Once you’re done, add Jenkinsfile and .ttm.yml files, commit and push. You need to associate testsuite from your junit test results and Test Definitions artifacts. ttm cli tool has a helper to assist you with that: ttm verify. At first run it indicates that no test suites have been linked to a test definition. You need to go in your test definitions artifacts and set in “automated_tests” field the test suite name (eg. ‘AccountingBalanceTest’). $> ttm send-results --username jenkinsbot --campaign-name "Test automated ttm"
Then check the status of your campaign in Test Management. Create a new Jenkins job “Pipeline” and point it to your SCM repository (you might want to use jenkins-tuleap-bot credentials to access the repo). You should also allow it to be triggered remotely. Check the “Trigger builds remotely” checkbox in the “Build Triggers” section and provide a secret Authentication token. Run a first build to configure the job. This job will fail. At second run it should prompt for a campaign name. Create a new campaign “Test automated ttm from jenkins” with the same test definitions than in previous steps. After a few moment, the pipeline should succeed and your test campaign in Test Management is updated. Edit your Campaign in Test Management and fill in the Jenkins job URL for the job you have just configured. Also fill in the Authentication token defined in the step before. 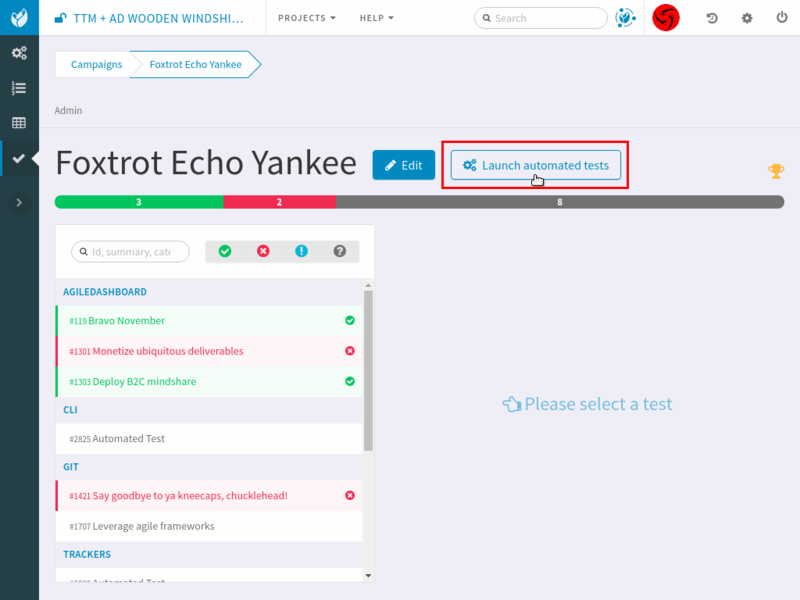 Once the campaign is configured, a button will appear in the Campaign details next to the Edit button: “Launch automated tests” The button lets you trigger the Jenkins job which will run the automated tests and set the corresponding Test executions to “Passed”!